Here is the card I made to enter the sketch challenge for Mojo Monday 163 - CONTEST The truth be told, I needed a card. 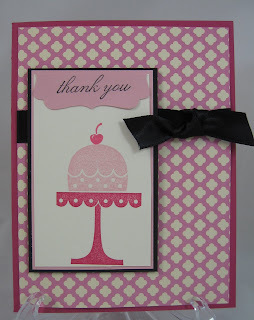 So I used the sketch and all Stampin' Up! products to make a blank card that will accompany all the orders I received before I went out of town. I'm glad that I waited until this evening to separate the orders, and get everyones 'bag' together. The 'bundles' were a huge hit! I received the last box of the back ordered items today. So, now everyone's order is complete! What a delicious little card! Nice take on the template.